MATERIAL- 50L. Water-resistant 600D polyester. YKK Zipper and YKK Buckle. Rain cover included. MOLLE WEBBING- This internal backpack can hang on small items, or for attaching additional tactical pouches or gear. QUICKLY ACCESS- The internal frame backpack has large zipped access at front that can quickly access to the main compartment,opend as a luggage. SUITS- The hiking backpack is well used as 3 day assault pack for hiking,trekking,camping,climbing,traveling. 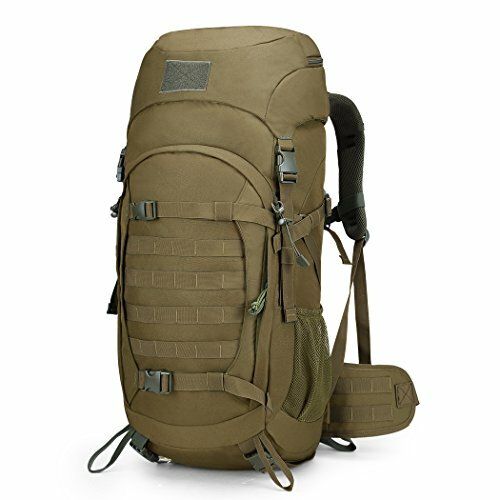 90 DAYS LIMITED WARRANTY- If you don't like this military backpack, it's available to return. This backpack is a nice choice for Gift! Modular lightweight load carrying equipment cover all around the pack,you can hang your sleeping bag,sleeping met,hammock,tent or other camping gears. Velcro nametape and flag patches (3.5*1.9inches/9*5cm). Hiking Pole Attachment can hold hiking poles, ice ax or selfie stick. A zipped pocket on the top of the pack, perfect for your rain cover (included). Hydration System Compatible. An internal hydration bladder’s compartment and a exit port on one side for the tube. The elastic compartment that is also suitable for a 15.6″ laptop and big enough for a 3 Liters hydration bladder or other items that require quick access.